I've had a lot of anxiety lately. As I'm sure every soon-to-be-new-mom has. We are so close to actually meeting this.... person that's been growing in utero these last eight months. So close. I wonder about the physical. What will she look like? Will she have J's eyes or mine? Will she have dark hair like me? J was a blond as a babe. Though truthfully, we all know brand new babies tend to look like little grandpas more than anyone else. I wonder about her interests. We both love art so much. We giggle about how she'll probably want nothing to do with art when she gets older. What will she be interested in? What will she want to be when she grows up? I have this fear that I won't be able to take care of a baby. Like basic needs. 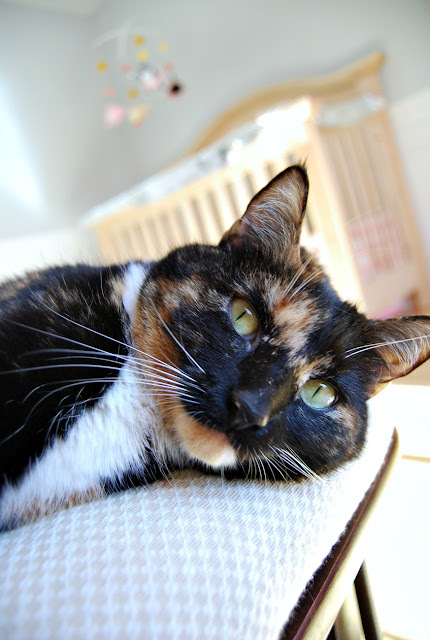 I've had a recurring dream lately where my little calico cat packs up her bags and leaves because I forget to feed her. Yes, it's actually a dream where a cat packs up a little hobo bag. You know, a bandanna tied to a stick. It sounds funny (it is), but I wake up really distressed. I worry about being a good parent. Teaching her to be a good person. Teaching her right from wrong. Teaching her to care for others. Setting a good example. Being patient and kind. I especially worry about being patient after working a full day at an elementary school. Being a working mom weighs on my conscience, too. But that's topic for another day. Or not, I know it's a touchy subject. That is the point of this post, in case you were wondering. I sat down the other weekend and went a little nuts making some baby clothes. 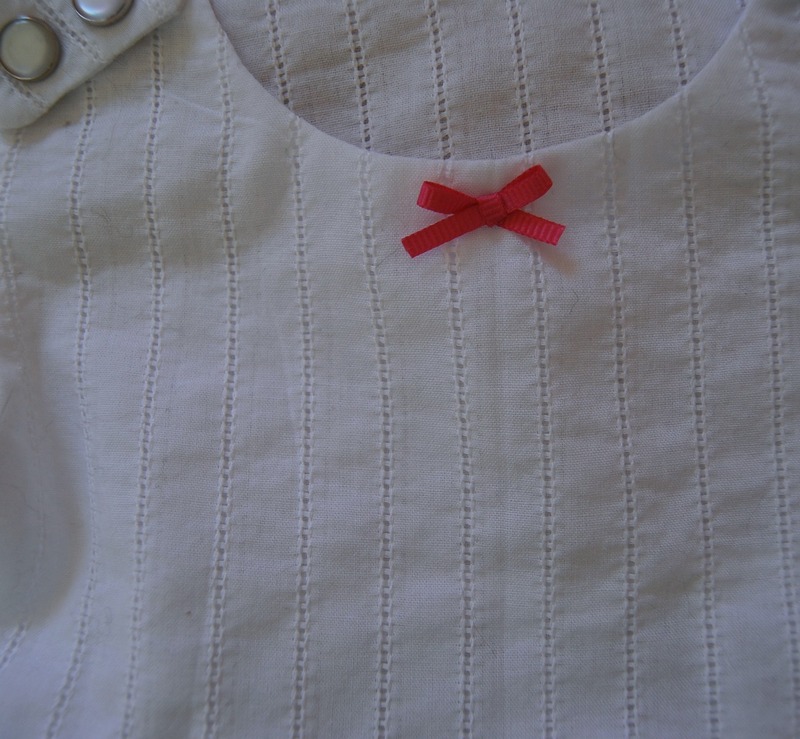 With a little help from Winifred Aldrich's Metric Pattern Cutting for Children's Wear and Baby Wear and a few baby patterns I own, I made a little bodice pattern. It either snaps at the shoulders or ties. 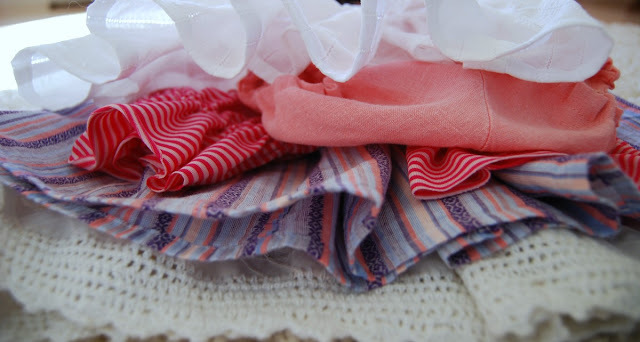 All of these outfits are sized for around three months, though I suspect they will fit more around six months. She should be able to wear them this summer. This outfit is made from leftover fabric from previous projects. 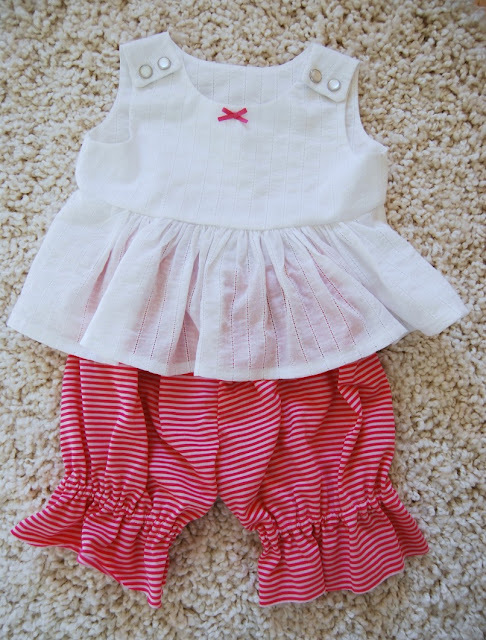 How fun is it that baby things take so little fabric? Glad I saved all my scraps. 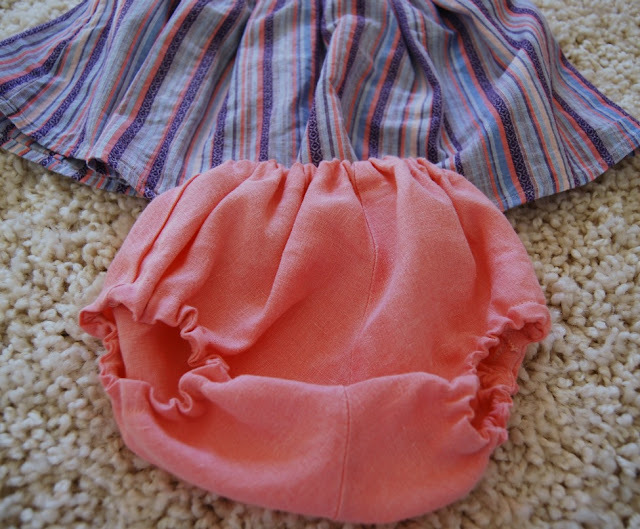 The little pantaloons came from a McCall's pattern. This dress is my favorite. The striped fabric began life as a cowgirl shirt complete with purple pearl snaps. I tried to salvage the snaps but couldn't. 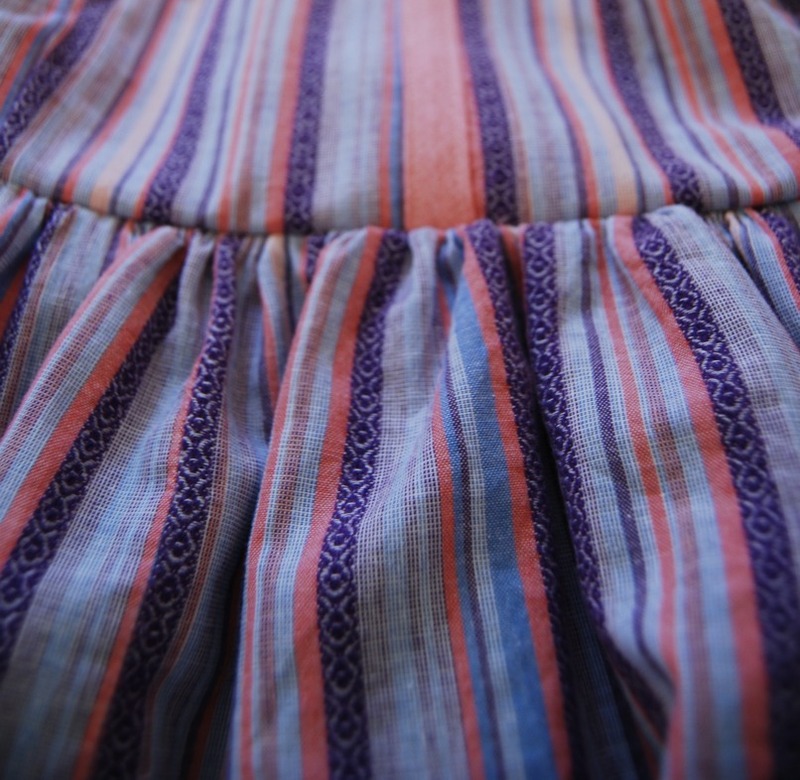 The bloomers and lining came from a favorite linen skirt that I can no longer wear. 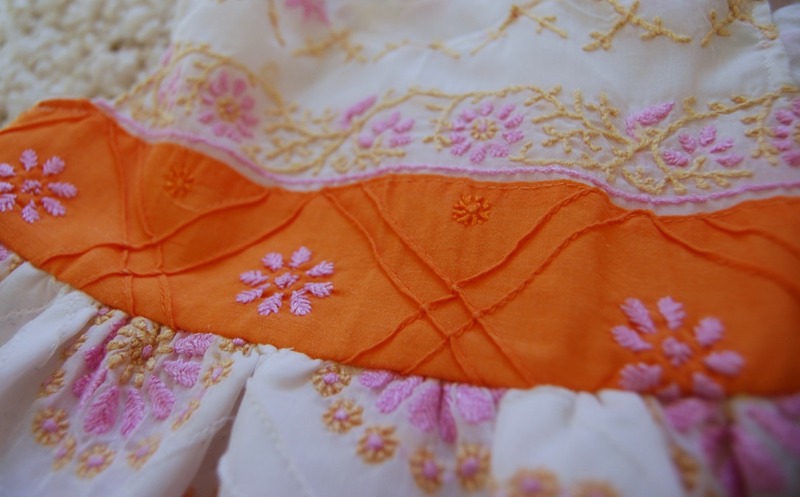 The linen is worn and soft and the most wonderful faded peach color. It was serendipitous that it matched the shirt so well. 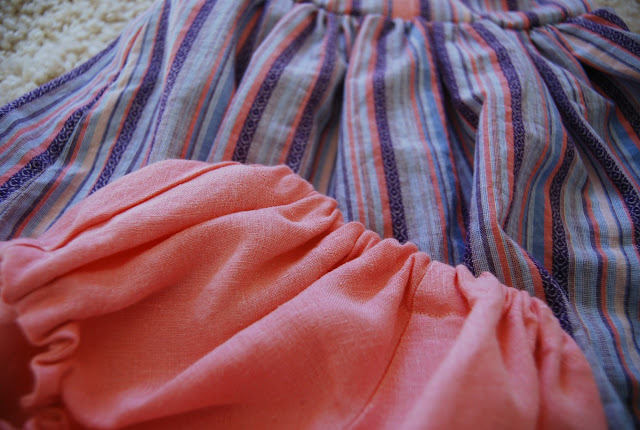 Does anyone else save old clothes because they love the fabric so much? I have a bucket full of old things I can't bear to giveaway because I want to re-purpose the fabric. It was fun to dig though my bucket and put some things to use. Like this last little dress. 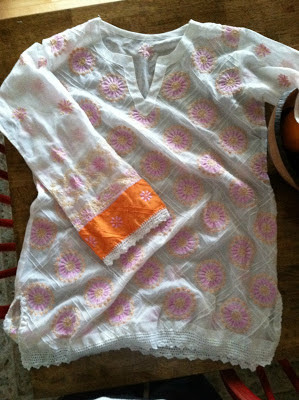 It was an embroidered airy tunic I never wore. 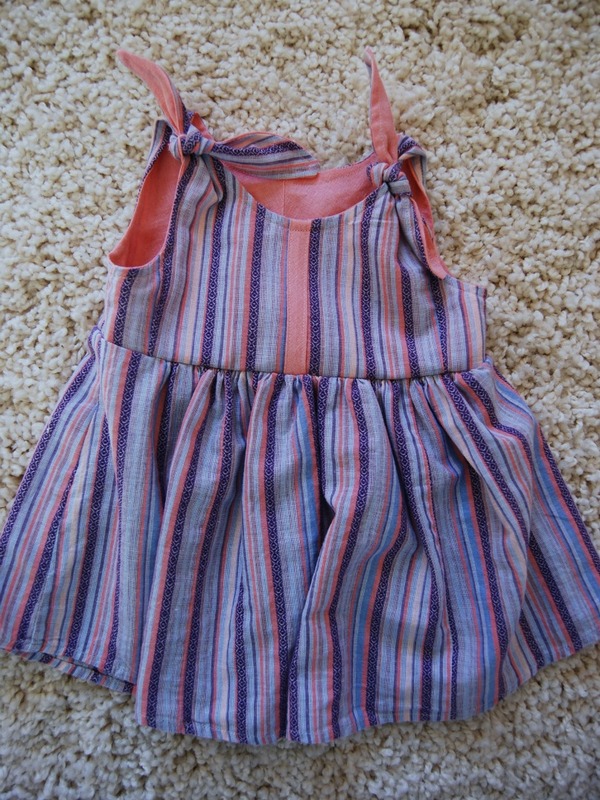 It looks better as a pretty little sundress anyway. Sewing little bitty things is so satisfying. Been working on nursery stuff. Of course. I can't believe how quickly time is passing during this pregnancy. And at the same time, I can't believe how slow it's going either. It's like some sort of bizarro time warp. 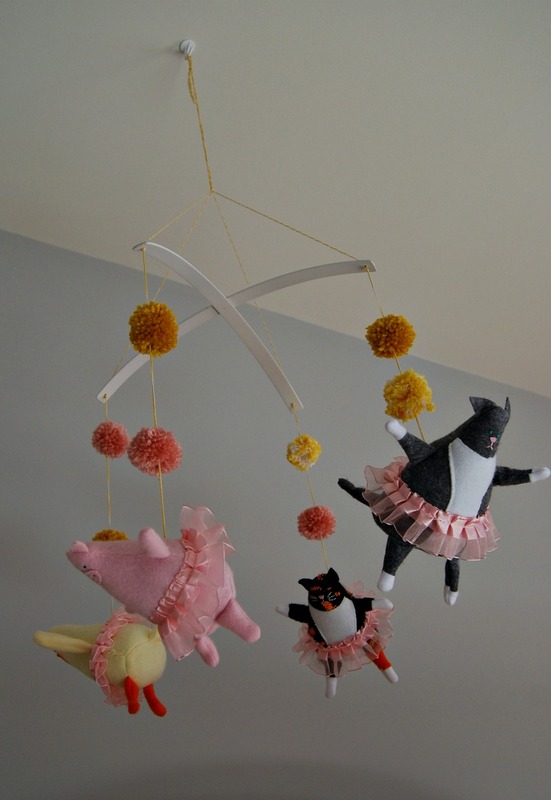 I made a mobile to hang above baby Jane's crib. I'm calling her baby Jane from now on. No, that's not going to be her real name. We actually don't have a name picked out yet. We are so indecisive. I think we are going to wait until we see her before we pick for real. So baby Jane it is, for blog purposes and for the fact that she is still a no name baby. I finished the crib skirt, too. Anyway, the mobile. So much fun to make. So much fun. I knew as soon as I was pregnant that I would make as many things in baby's nursery as possible. I've done a few sets of baby bedding for friends and friends of friends in the past couple of years. 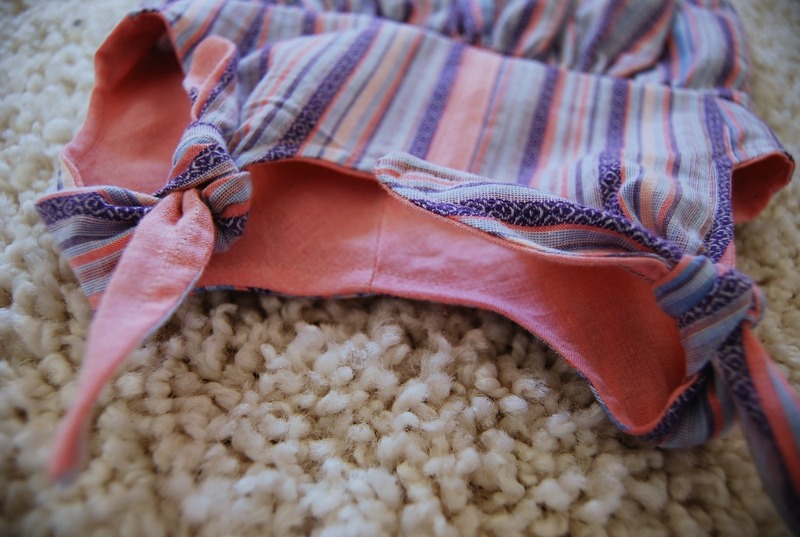 During my initial research on how to do it all, I realized that I was not too keen on all the bedding sets that were available at chain stores. 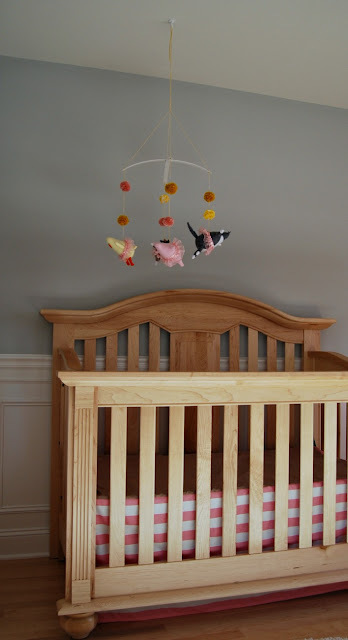 And I hated the plastic mobiles that attach to the side of the crib. I especially dislike the fabric cover they put over the arm of the mobile. Blech. So I knew I wanted to make my own mobile. 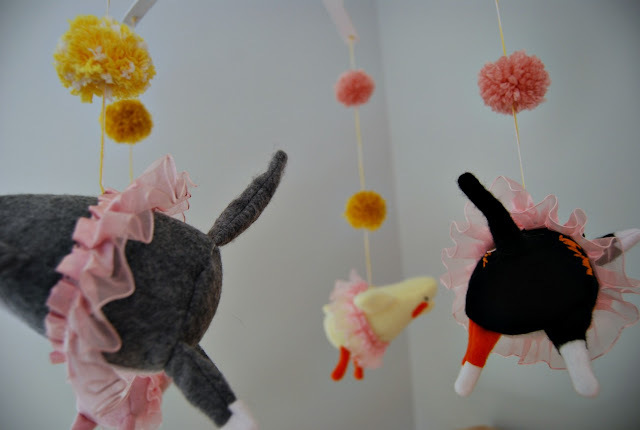 Every nursery should have a cute mobile. I wanted silly animals. Silly little animals are my favorite thing to draw. I draw animals all the time at work. I'll have to show you my crazy mixed up animal book some time. If I have the time, I'm going to do some drawings to hang on the walls in the nursery, too. I thought it would be great to have some funny looking fat cats hanging from a mobile. Which made me think of my own two cats. I did some internet research on making mobiles but was stumped on how to put it all together. I've made mobiles before as art lessons. Wire mobiles with hanging shapes. Wooden mobiles with paper mache things dangling. They are a pita to balance. I had some elaborate Alexander Calder system in my head and no idea how to execute it. 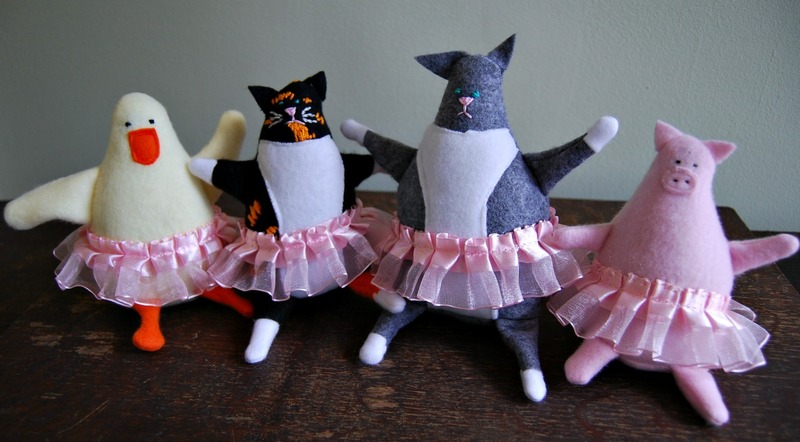 And then Nancy over at Owen's Olivia posted an etsy feature about Pink Cheeks Studio. And I was totally and completely smitten with the pigs in tutus. The tutus. Ha! 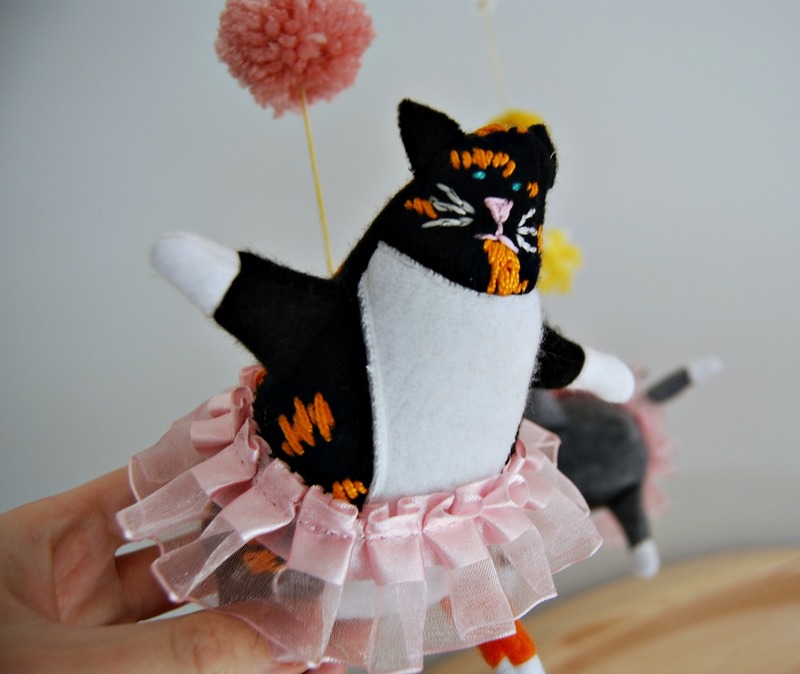 All the work at Pink Cheeks Studio is whimsically amazing. Is whimsically a word? If not, it should be. 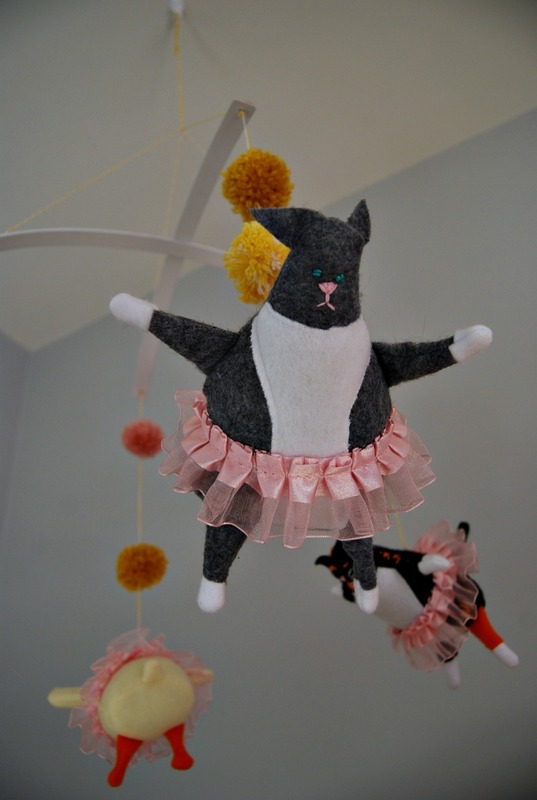 I needed a mobile with animals in tutus. So I blatantly copied the tutus. I think I even found some of the same trim, or close. And I decided I needed a pig. And pom poms. The duck came after I thought about all the pink and yellow in the nursery. All the animals are made out of fleece and felt. I had to make a few prototypes before I came up with the right size and shape. They are all sort of shaped like a cone. With funny little arms, legs and ears sticking out of seams. The two cats just make me giggle out loud every time I see them. Did you notice that the calico cat has one orange leg? She has a tiger leg in real life. We call it her party leg. Her other legs are all business. 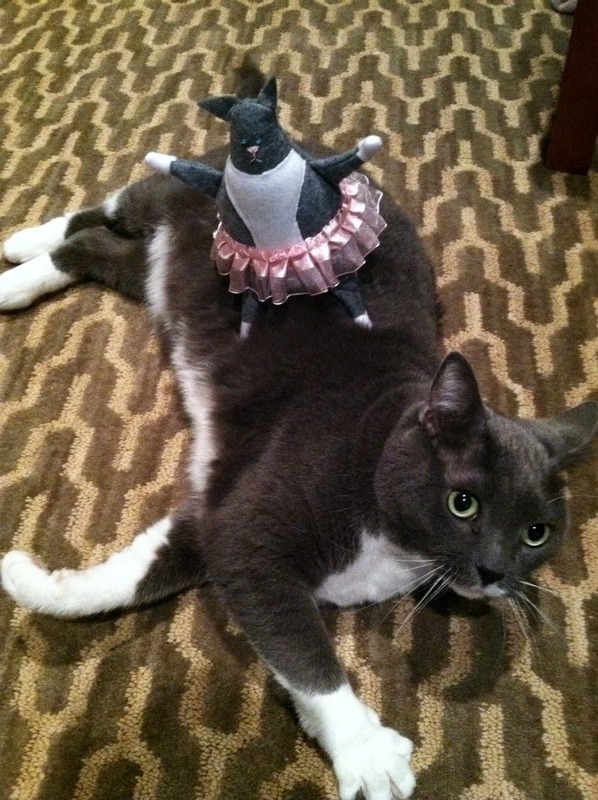 Socks, unfortunately, is not amused. He does not appreciate the tutu. My favorite part: the butts floating in mid-air. I hope this mobile makes baby Jane smile as much as it makes me smile. So how are the cats doing with all the change going on 'round here? Just fine. They'll be fine. The little calico one is learning where she is and is not allowed. She is allowed on the ottoman. Or the floor. Not the glider or dresser, though. And definitely not the crib. 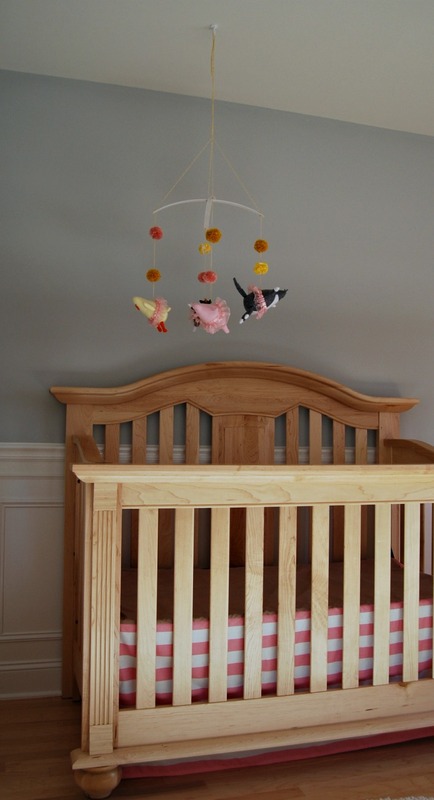 Hanging a giant dangle-y cat toy above the crib sort of sends mixed signals though! 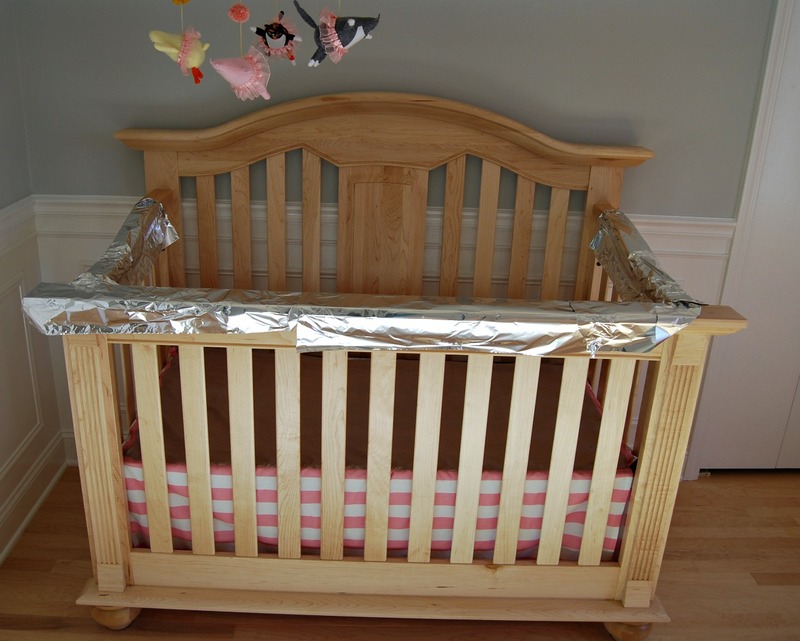 That's where the tin foil comes in. Thanks so much to whoever suggested using foil. She hates it. I cackle evil-like when I think about how much she can't stand the foil. Though it leaves something to be desired when it comes to the decor. 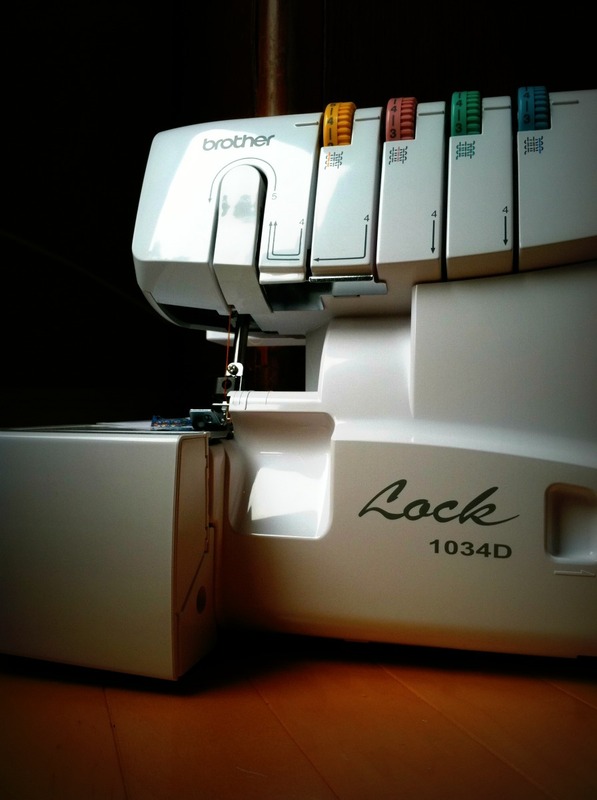 Hey online sewing community. Y'all are awesome! I was so encouraged by all the great information and links you passed along in the comments the other day. I sat down the next night and sidled on up to Sergio. He is quite the gentleman, by the way. Not nearly as scary as I though he'd be. Thank you so much for all the great suggestions and advice. I watched this awesome video and I have had no trouble threading. I threaded it the first go no problem. I'd say the 1034d is super user friendly. I used a bunch of different partial spools of blue thread (not sure why I had so many) and I ended up re-threading the machine several times as a spool ran out. I highly recommend doing the same at first because now I'm totally confident in my ability to thread my serger. It really is not too difficult. Yes, that's snow and no, I'm not cold. My crazy pregnancy hormones keep me hot and flustered all the time now. We had about a inch of wet snow yesterday. The only snow of the season. I watched a few other videos as well. The dvd's that came with the machine wouldn't play on our old Mac laptop. Someone else complained of the same issue, just fyi. Then I rummaged around in the stash and came up with this blue ponte knit. I measured the widest part of my hips, divided in two and cut two rectangles using that measurement. I didn't add any seam allowance. I figured the stretch would take care of some of that. 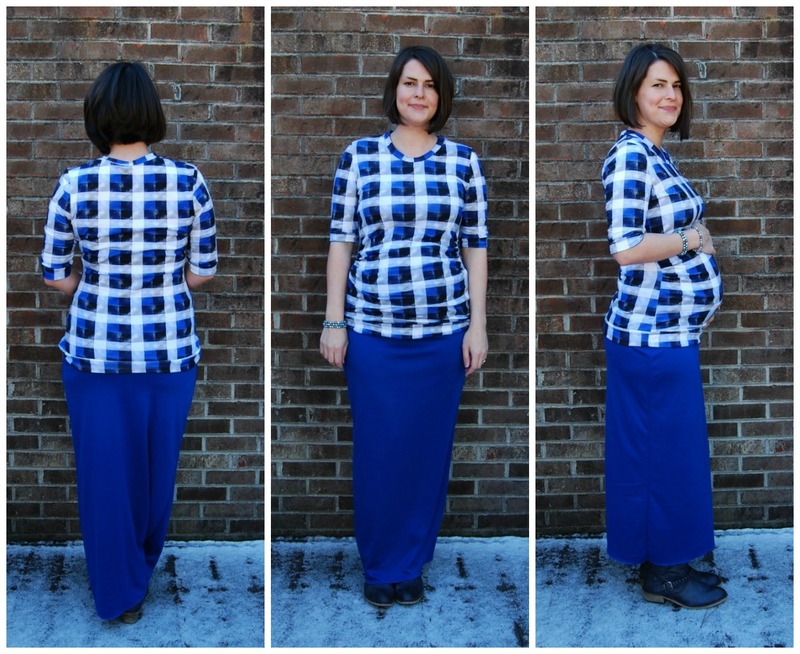 I also wanted the skirt to be snug so I can wear it post baby. Then I cut two more rectangles for the band. They were each twenty inches high so I have a ten inch fold over band in case you are interested. Very slapdash methods, I daresay. I tested the tension on a few scraps ( I did need to adjust the upper looper) and I was off. Three seams later, I had a maxi maternity skirt. This has to be the fastest garment I've ever made. 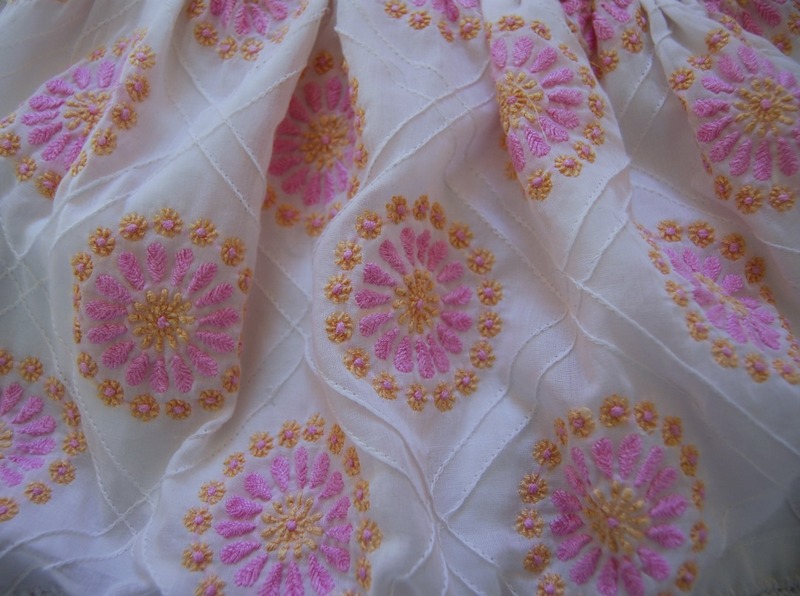 My only regret is that I didn't give myself some sweep at the hem. It's a straight up-and-down column. Which is okay. 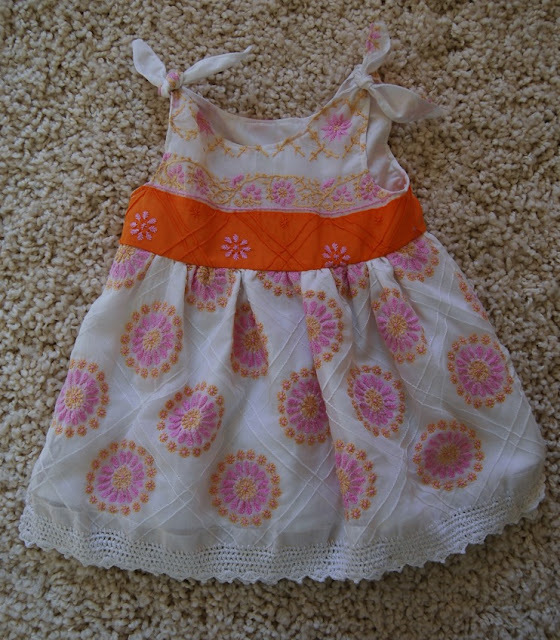 But if I make another I'll add some width to the hem to make it more a-line. In some of these photos I'm wearing it folded up a second time. I attempted to use the blind hem foot on some scraps but it was a disaster. I'll need some more practice before I master that. So I just serged the bottom edge of my skirt and left it. If I'm ever feeling more proper, I'll flip it up once and stitch on my regular machine. I made another maternity tee next. 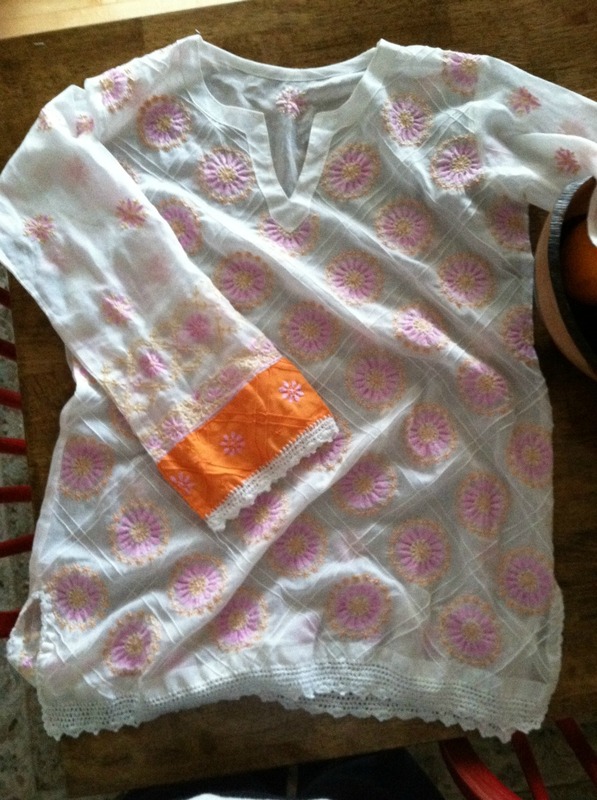 I used the same Burda long sleeve tee pattern as before and a rayon knit from the stash. I did have to up the differential feed for this knit to prevent wavy seams. Always test on a scrap first! This time I added a bit of width as well as length for ruching. I didn't bother matching any plaids. Hope you're not too horrifed. Pretty much every seam is either ruched or eased in anyway (all the bands are a tiny bit shorter than the edge they are attached to), so I'm not sure how I could have matched anything anyway. Not much else to say. These are definitely not the best executed garments in the world, but they were both perfect for learning to use my new machine. I wanted to flip the inside out and take another photo, but I was too lazy. You'll just have to trust that all my seams are nicely serged! I'm so excited about all the options I have now and all the useful techniques I get to learn. Again, thanks so much for all the suggestions. I think I'm definitely going to take that Craftsy class eventually to make sure I take advantage of all the different functions my serger has. This is the bump at 33 weeks. Let me just say, it is getting harder to post pictures of my giant self these days ;) I did my best to look cute and pregnant. But I'll be honest, I feel like a sack of potatoes. All lumps and bumps and bosoms. Hehehe. It's all worth it. It's hard to believe I'm still going to get bigger. Craziness! We can hardly wait for this last seven weeks to pass by.